Stopped by Skinner Howard Contemporary Art yesterday and took a quick peek at Looted, the new Rogelio Manzo show. Manzo’s work is a good example of art that needs to be seen in person to appreciate. When I saw photos of the images online before the show I wasn’t particularly interested; in person the work (often much bigger than one might assume) has a luminous quality that isn’t captured well in photos. He’s got a good control of paint, and the active brushwork in the figures shows an appealing confidence that keeps your eye moving. Most of Manzo’s portraits are painted on resin based carriers that refract light througout the image, even behind the painted portraits. The effect is interesting and unusual- one can make out the hanging hardware on some of them- and speaks to an artist that isn’t afraid to bend some rules. While I was intrigued the overall effect of the work, I’m not bowled over by Manzo’s actual rendering. The facial features in his portraiture tend to be outsized and cartoonish- they remind me a LOT of the faces drawn by amateur comic book artists with more experience learning other artists’ styles than looking at real people. The same is true of the clothing his sitters wear. It’s as though Manzo knows what a torso looks like and knows what a suit looks like, but has never really paid attention to anyone actually wearing one. These portraits owe a nod to Francis Bacon, and the comparison doesn’t help Manzo. 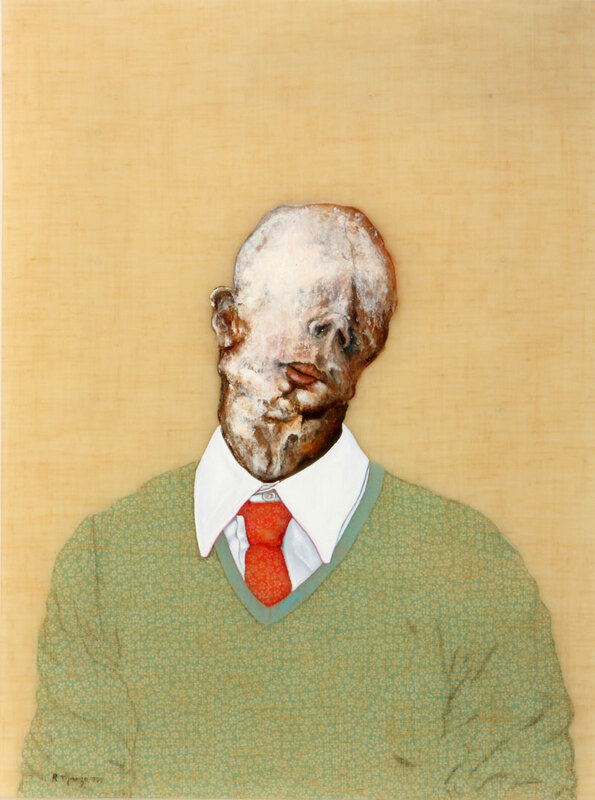 Bacon’s masterful scrambling of features leaves the sitter not only intact, but eerily enhanced; Manzo’s decomposed faces leave the sitter identityless – which may well be his intent. 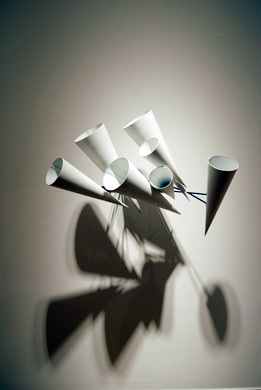 While you’re there, take a look at the Dean DeCocker sculptures left from the last show. Playful and well-executed, the sculptures seem almost like store displays for unknown artifacts. There is a vague Eames feel to some, perhaps because of the surfboard shapes and the use of bent steel rods for framing- the work has an overall industrial pop feel. Cleanly constructed and appealingly light, the work is unchallenging without being corny. I like.